The Indian Brave is the fifth design in the American Western Skulls Collection. Following the Indian Chief, Outlaw, and Sheriff, the brave represents a figure that was depicted in varying ways in American lore from the era of the Wild West. Some of those visions were positive and correct, others were not. Right now, 1 oz Antique Silver American Western Skulls Indian Brave Rounds are available to purchase online at Silver.com. Ships to you inside of plastic capsules with a Certificate of Authenticity! Fifth silver round issued in the American Western Skulls Collection! Mintage limited to 1,500 rounds only! The obverse includes the Indian Brave design. 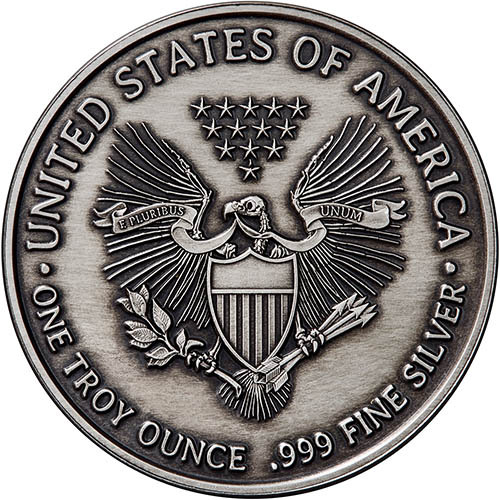 The reverse features a unique vision of the heraldic eagle of the United States. Serial numbers featured on the round’s edge. Each 1 oz Antique Silver American Western Skulls Indian Brave Round available here today comes in a protective plastic capsule. The rounds in this series all have an edge-lettered serial number that is reflected on the individually numbered Certificate of Authenticity included with purchase. The antique polish applied to these 1 oz silver rounds brings the brilliance of hundreds of years of patina and age, without the wait. The polish not only gives the rounds a sense of ancient coinage visually, but it also helps to highlight the intricate design elements featured on both sides of the round. On the reverse of the 1 oz Antique Silver American Western Skulls Rounds is the heraldic eagle of the United States. The triangular cluster of 13 stars remains above its head, while the eagle has the national shield on its chest, the arrows of war in one talon, and an olive branch of peace in the other. What makes this so-called fried eagle design different is that the bald eagle depicted has succumbed to the death and destruction of the Wild West. 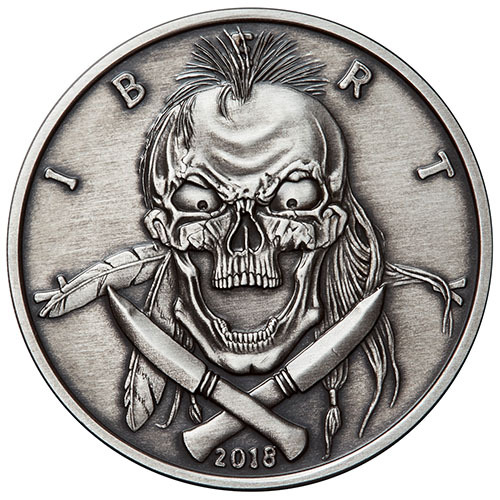 The obverse of the Antique Silver American Western Skulls Indian Brave Round features the image of a singular Indian Brave warrior’s skull. He has hair with feathers woven in and a fearsome gaze as he shouts out a war cry, but he is, in fact, a dead character and below his skull are two knives crossed just above the year of issue. If you have any questions for Silver.com, please don’t hesitate to ask. Our customer service team is available to you on the phone at 800-276-6508, online using our live chat service, and via our email address. You’ll find spot silver prices available on our website at all times for your convenience!